Karen Yankovich is the President of Uplevel Media, which is a social media marketing agency that delivers profitable cutting edge digital strategies. She is an internationally recognized LinkedIn evangelist and social media consultant who is an expert at helping businesses use LinkedIn and a range of other social spaces in a profitable way. Her latest venture is called “Get Seen/Be Heard” and it provides social media and do-it-yourself PR training to thousands of members. Why LinkedIn? What does this platform offer that other forms of social media do not? I will share a resource that directly helps LNCs make sense of social media. I wrote a book specifically to address the power of social media in helping LNCs attract clients. You’ll use it to discover how to use common social media platforms so you can decide where to invest your time. 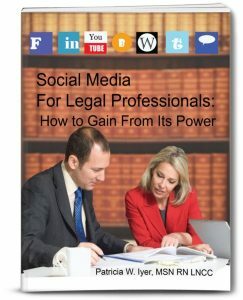 Social Media for Legal Professionals is an essential book for legal nurse consultants. Karen is an expert at helping businesses use LinkedIn and a range of other social spaces profitably. Her newest venture, Get Seen Be Heard, provides social media and do-it-yourself PR training to 1000’s of members. A popular trainer and international speaker, Karen’s social media advice and expertise can be found in guest contributions to DailyWorth.com, Huffington Post, Social Media Examiner and Career Talk Radio on Sirius XM. This was an excellent podcast. I l was unsure what to include in my introduction to attorneys to connect with them. This podcast provided some excellent advice. Glad it was helpful, Ruth.